Statue of limitations, you say? Not applicable in these 15 countries, at least. This monumental selection of sky-high statues showcases the tallest figural sculptures in their respective countries – all built, it would seem, with a higher purpose in mind. 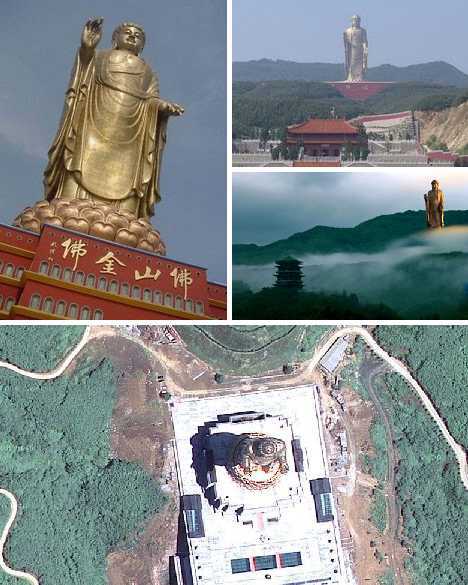 Completed in 2002, the Spring Temple Buddha is both China’s and the world’s tallest statue at 128 m (420 ft). That figure is for the Buddha and its Lotus Throne: if you include the 25 m (82 ft) tall pedestal building the statue stands upon, the total height increases to an awe-inspiring 153 m or 502 feet! 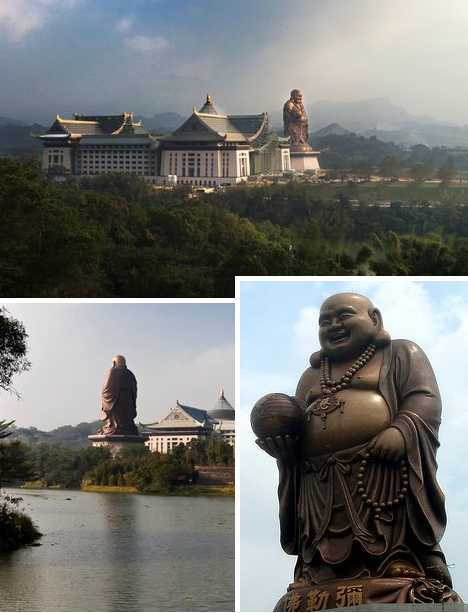 The statue and its associated facilities are located within the Fodushan Scenic Area in Lushan County, Henan province. 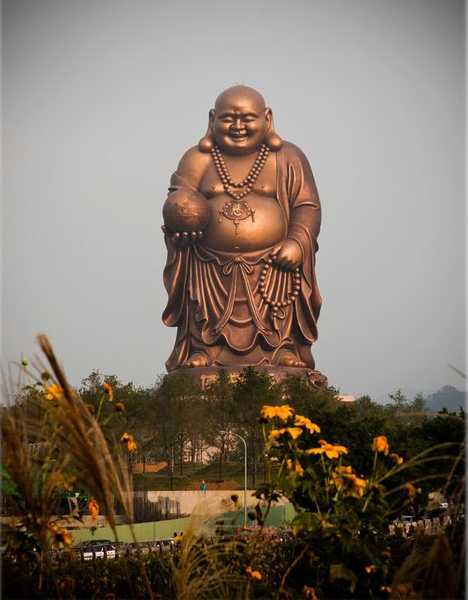 The statue is a representation of the Vairocana Buddha, who in Chinese Buddhism is said to embody “shunyata”, the Buddhist concept of emptiness. Vairocana statues are often very large in size so that when in their presence, one can truly feel the lack of permanent identity and the accompanying emptiness of conditioned existence. Sure makes ME feel small! 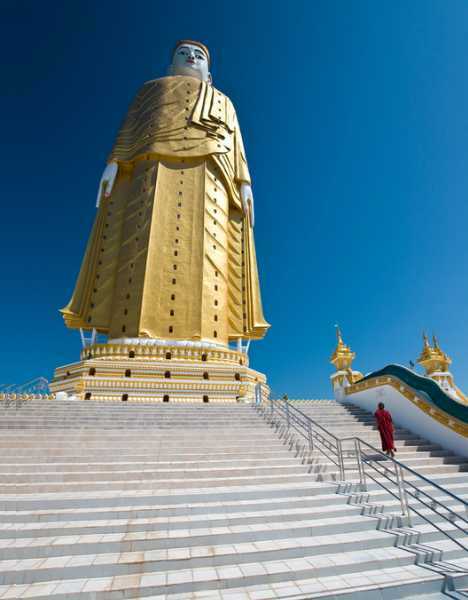 Laykyun Setkyar, located near Monywa, Myanmar, stands 116 m (381 ft) and stands on a 13.5 m (44.3 ft) tall throne. The main image above dates from 2006 when the massive monument was in its 10th year of construction – it formally opened in February of 2008. The Laykyun Setkyar complex features two enormous Buddhas: one standing and one reclining. 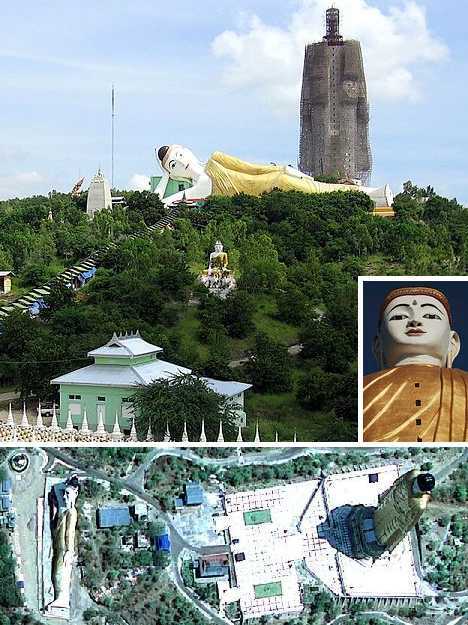 Tourism to Monywa sparked by the unveiling of the Laykyun Setkyar statues has increased greatly, providing both income to local businesses and a window to the outside world for Burmese citizens of this culture-rich, ancient city. 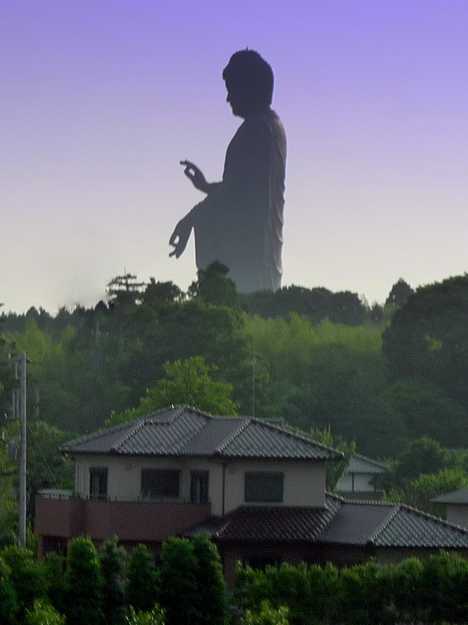 The Ushiku Daibutsu, completed in 1993, stands 120 m (394 ft) tall including its 10 m (33 ft) high base and 10 m high lotus platform. The statue weighs just over 4,000 tons and is plated in bronze. 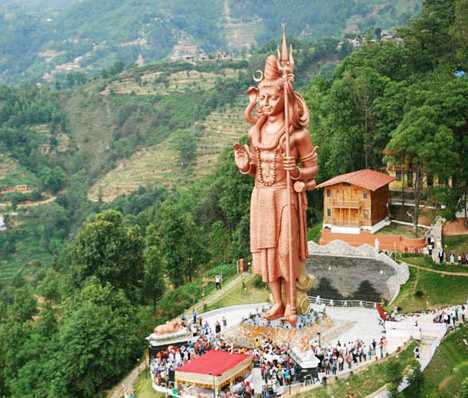 Just to give one an idea of this statue’s immense size, consider these dimensions: its eyes are 2.55 m (8.35 ft) wide, its mouth is 4.5 m (14.76 ft) wide and its first finger stretches a full 7 m (23 ft) from base to tip. 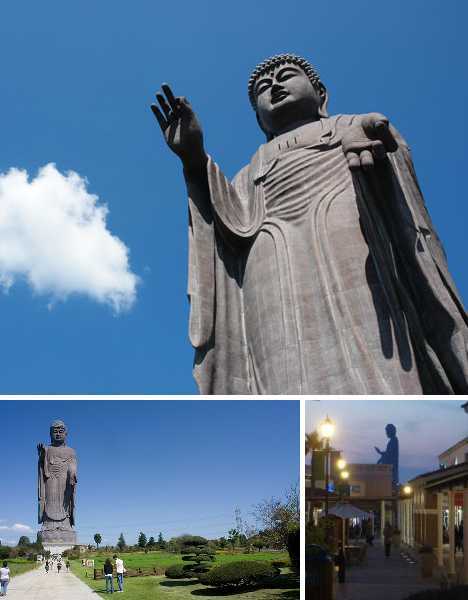 The Ushiku Daibutsu is located in Japan’s Ibaraki prefecture north of Tokyo and represents the Amitabha Buddha. Visitors can tour a 4-story museum built into the statue. Windows on the top floor look out through the statue’s chest, providing a birds-eye view of a flower garden and small animal park on the grounds below. This monumental statue of Russian Czar Peter the Great towers 94 m (308 ft) into the Moscow sky… though the fact hardly pleases many Muscovites. The statue, created by Georgian architect Zurab Tsereteli and unveiled in 1997, regularly appears on lists of the world’s ugliest buildings, statues and monuments. 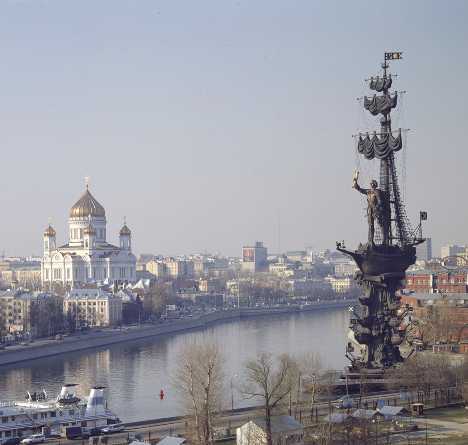 The purpose of the statue was to commemorate the 300th anniversary of the Russian Navy. 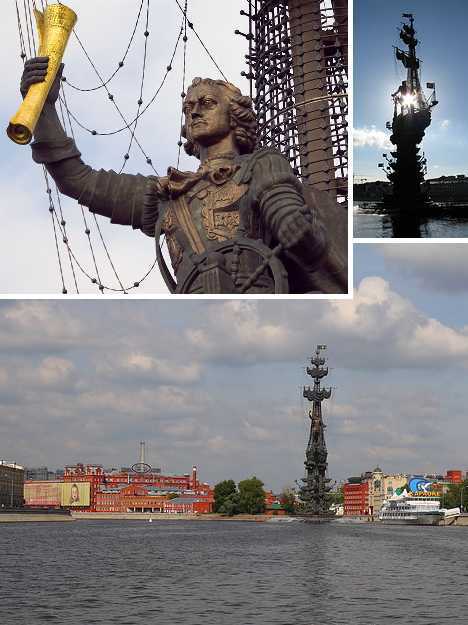 Rumors suggest that Zurab Tsereteli designed the statue to represent Christopher Columbus but could find no takers for it in the USA, Spain or Latin America. He then modified the work and offered the 600-ton piece to his good friend, Moscow mayor Yuri Luzhkov. Moscow’s current mayor, Vladimir Resin, has suggested the statue be moved to St. Petersburg but authorities there won’t touch it with a 308-ft pole. 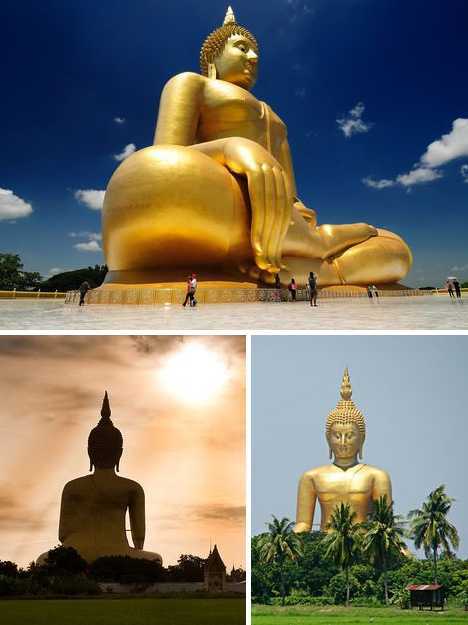 Thailand boasts an abundance of large, golden Buddha statues but none can compare with the Great Buddha of Thailand, situated in the Wat Muang Monastery in Ang Thong province. 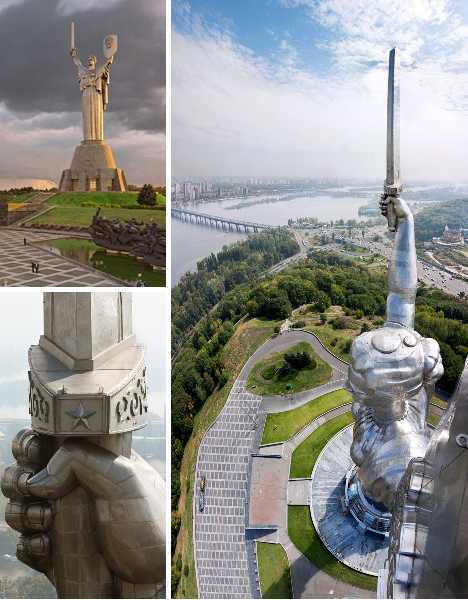 The 92 m (300 ft) tall statue is 63 m (210 ft) wide at its base. Construction began on the Great Buddha in 1990 and 18 long years passed before it was finally completed! 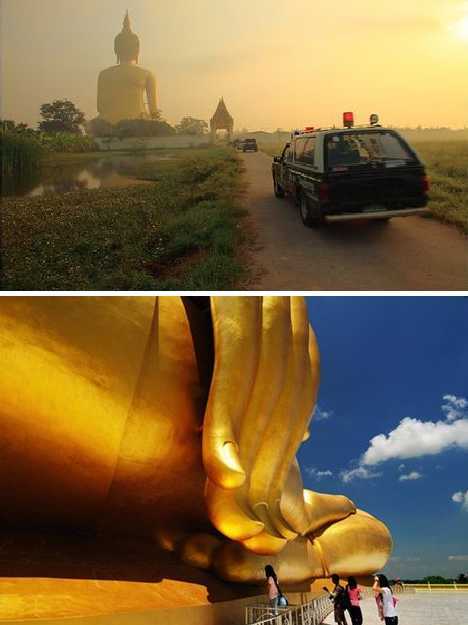 The Great Buddha of Thailand was designed according to the precepts of Theravada Buddhism. Visitors to the site, about 2 hours’ drive north of Bangkok, can also enjoy Wat Muang temple’s “Hell Park.” This Buddhist version of Dante’s Inferno features “macabre scenes of mutilation & death depicted through large colorful figures all set in different themed scenes.” Fun for the whole family! The Great Standing Maitreya Buddha who rises above the shore of Emei Lake near Beipu in Xinzhu County, Taiwan, doesn’t exactly fit the mold of a tall, graceful sculptor’s model – but then again, that’s just not his style. 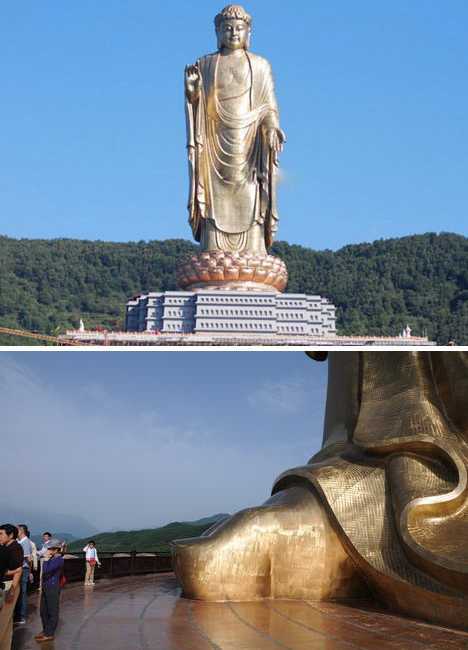 The 72 m (236 ft) tall statue represents a Maitreya (“returning”) Buddha who will return some day to share his enlightenment with the rest of the world. When that day comes, be sure to stay out of his way! 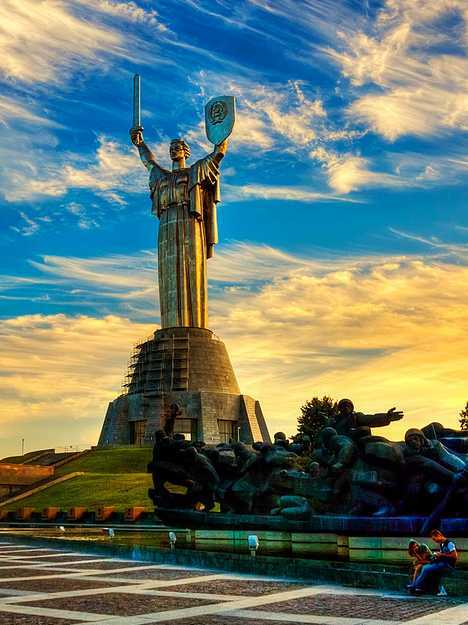 The 62 m (203 ft) tall Mother Motherland monument in Kiev, Ukraine, was unveiled in 1981 and was constructed as a tribute to Soviet soldiers who died in The Great Patriotic War – known to the rest of the world as World War II. 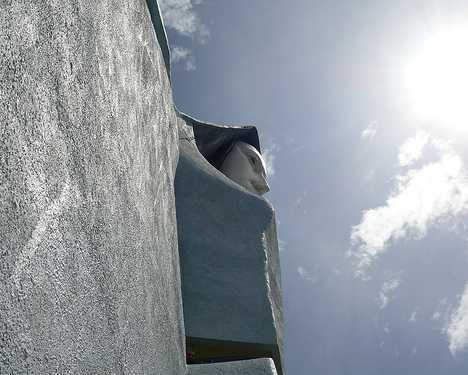 The statue differs from many of its type and size, being made from steel that gleams brilliantly on bright, sunny days. Just imagine how it would look if the original design, which called for a gold leaf over bronze, would have been followed? The Mother Motherland monument weighs a staggering 560 tons and grasps a 16 m () long, 9 ton sword in its right hand. Combined with the masonry and stone Memorial Hall museum that acts as a base, the statue rises 102 m (334.5 ft) into the skies above Kiev. 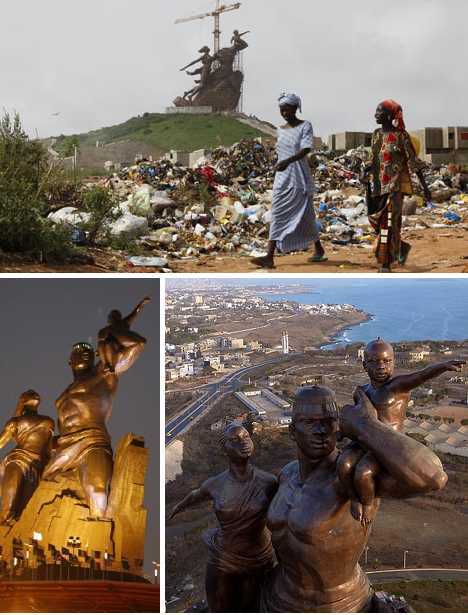 Say you’re the president of an African nation and you want to commemorate your country’s 50th anniversary of independence with a massive statue… built on a budget, by North Korean engineers. 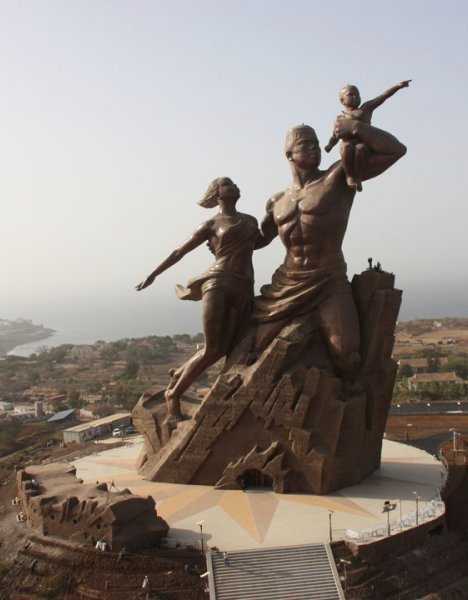 The result would probably look a lot like the 49 m (161 ft) tall African Renaissance Monument that looms over Dakar, Senegal. 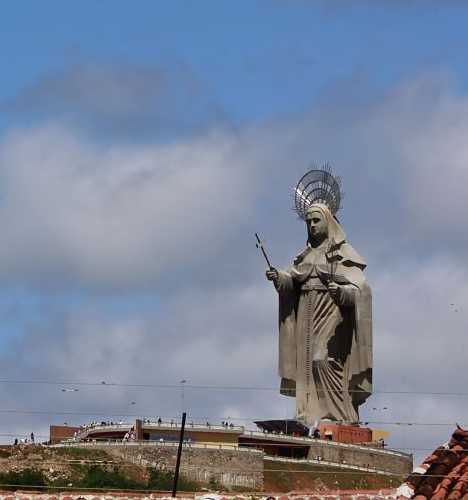 Spanish-born artist Manuel de la Fuente designed the 46.7 m (153 ft) tall Virgen de la Paz, which watches over the city of Trujillo from the top of a nearby hill. 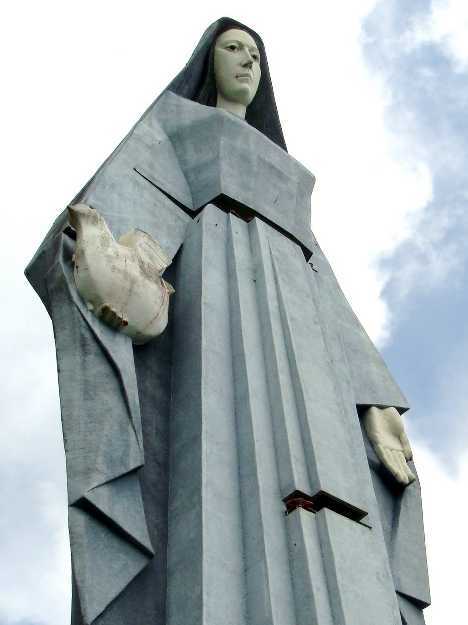 The 1,200 ton statue of the Virgin Mary is made from painted concrete and weighs approximately 1,200 tons. This monumental sculpture is designed so that visitors can climb interior staircases to reach any one of five observation points. Opened in 1983, the statue is the tallest figural sculpture in the Western Hemisphere, just under a meter (-3 ft) taller than the Statue of Liberty – a fact Venezuelan President Hugo Chavez must surely find gratifying. 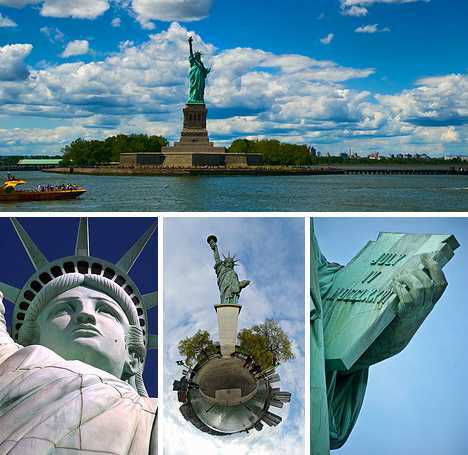 The Statue of Liberty, or more correctly Liberty Enlightening the World, was a joint project of the United States and France: the former built the pedestal while the latter provided the statue. Though the 46 m (151 ft) tall monument to American independence was not officially dedicated until October 28th, 1886, her arm was displayed at the 1876 Centennial Exposition in Philadelphia and subsequently at Madison Square Park in New York City from 1876 to 1882. Some Statue of Liberty trivia: New York City’s first ticker-tape parade celebrated the opening of the statue and President Grover Cleveland presided over the dedication ceremony. 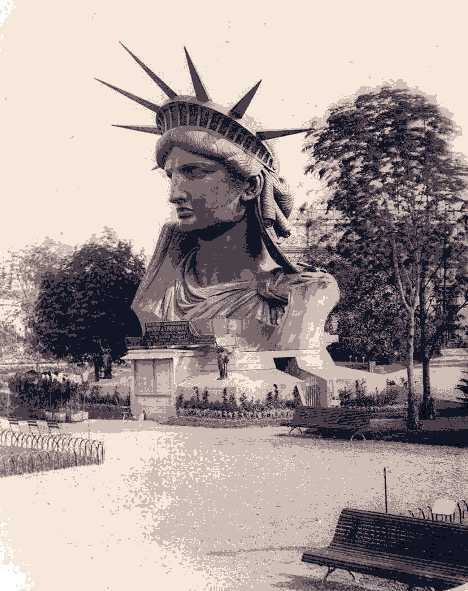 Both the arm and the head of the statue were finished first so that they could be used to boost fundraising efforts; the image above shows the statue’s head on display at the 1878 Paris World’s Fair. Last but not least, visitors were once able to stand on a small open-air balcony encircling the statue’s torch, but for safety reasons access to the balcony has been prohibited since 1916. 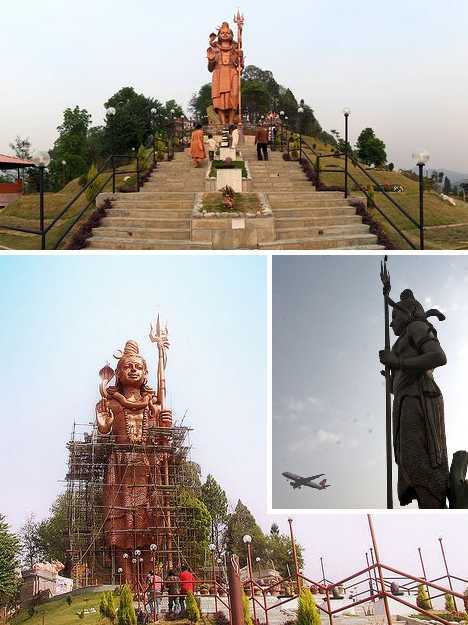 Those wishing to visit this monumental statue of the major Hindu deity Lord Shiva will find it about a half-hour’s drive out of Kathmandu. Hikers should prepare for a journey of 20 km (12.4 miles). Upon arrival, travelers will be pleased to find the complex surrounding the statue includes a 16-room resort, a spa with steam and sauna bath facilities, a children’s park, and a meditation center. 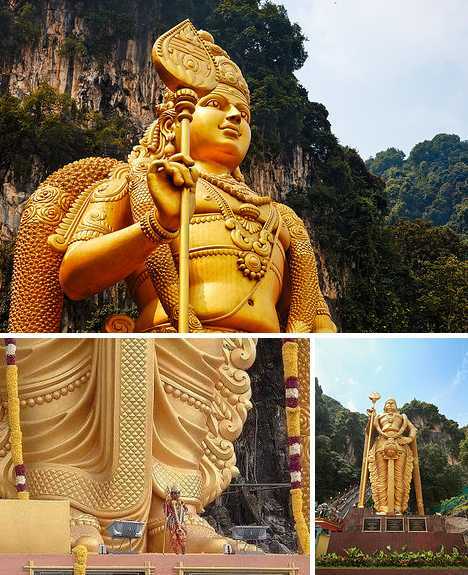 The largest Lord Murugan statue in the world stands 42.7 m (140 ft) tall, at the entrance to the Batu Caves 13 km (8.1 mi) north of Kuala Lumpur, Malaysia. 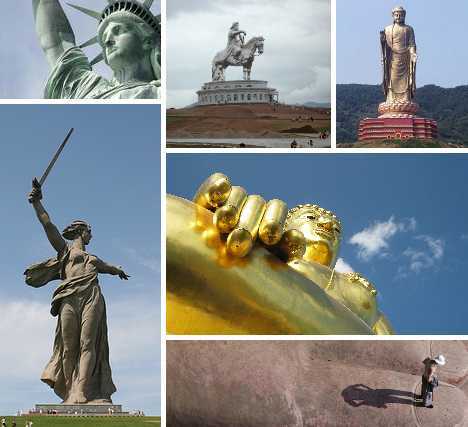 Completed in early 2006, the statue required the use of 1550 cubic meters of concrete and 250 tons of steel support bars, topped off with 300 liters of gold paint. 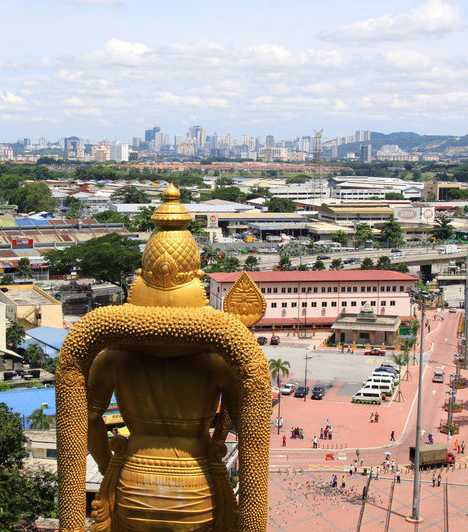 The statue of Lord Murugan is positioned with the Batu Caves behind him while his gaze falls upon the capitol of Malaysia, Kuala Lumpur, off in the distance. 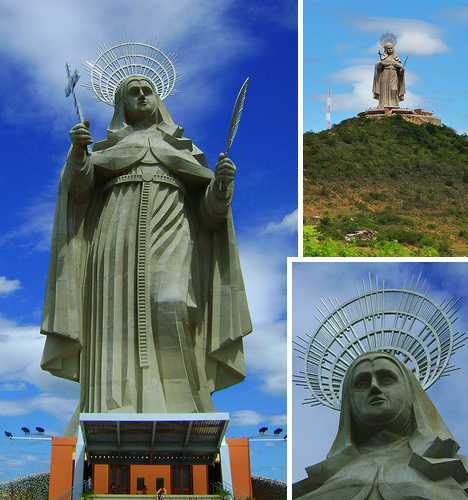 The statue of Santa Rita de Cássia stands 42 m (137.7 ft) tall and is located in Santa Cruz, Rio Grande do Norte, Brazil. When one includes the 6 m () pedestal and 8 m crown, the monument’s total height increases to 56 m or 183.7 feet. Like many of the world’s largest statues, this representation of St. Rita of Cascia is of very recent vintage, having been completed in the year 2010. 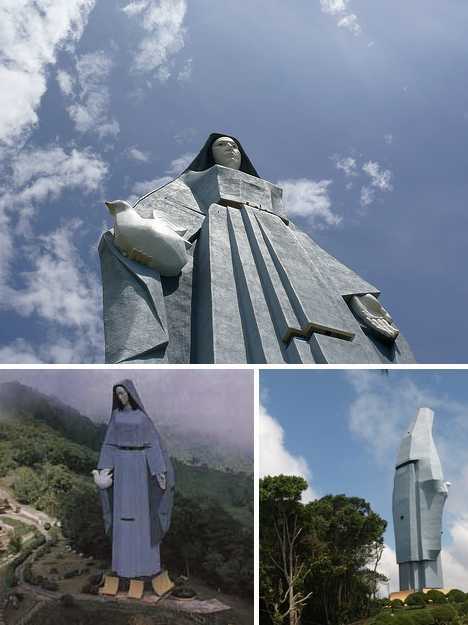 Said to be the “world’s largest Catholic statue,” this striking monument is 19.8 m (65 ft) taller than the famous Christ the Redeemer statue that looks down upon Rio de Janeiro from the 700 m (2,300 ft) high peak of Corcovado mountain. Maybe you haven’t heard of Veera Abhaya Anjaneya Hanuman Swami, but he’s quite big in India. Actually, he’s the biggest… statue, that is. 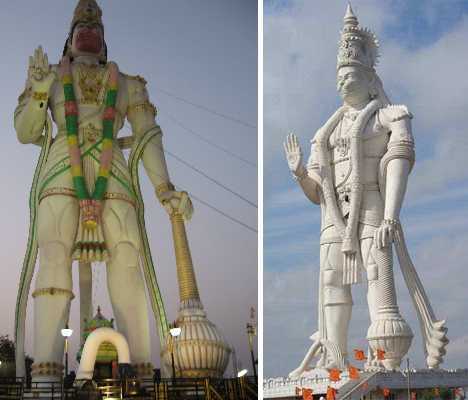 The statue of the Hindu deity Hanuman stands 41 m (135 ft) tall and is located in Paritala, about 240 km () from Hyderabad in India’s Andhra Pradesh province. 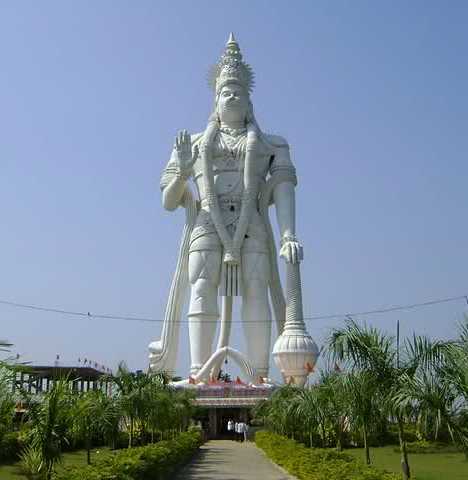 Veera Abhaya Anjaneya Hanuman Swami is both the tallest statue in India and the tallest statue of Hanuman in the world. Veera Abhaya Anjaneya Hanuman Swami was completed in 2003 and appears appropriately powerful – as would befit Hanuman, who in Hindu mythology is a General of the Vanaras, a forest-dwelling race of ape-like creatures and and a much-loved disciple of Lord Sri Rama. The 40 m (132 ft) tall Genghis Khan Equestrian Statue dominates the arid, treeless steppes of Mongolia, much like its human inspiration did almost 800 years ago. 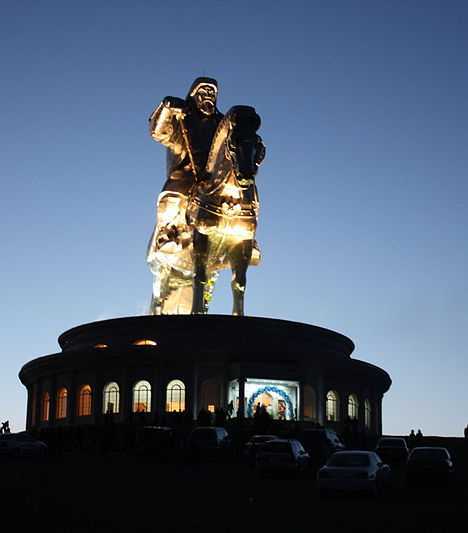 The statue is located 54 km (33.5 miles) east of Mongolia’s capitol, Ulan Bator, on the bank of the Tuul River. Plated with 250 tons of stainless steel, the statue looks especially awesome at night when it’s lit up by floodlights.. The Genghis Khan Equestrian Statue opened in 2007 but construction of the Chinggis Khaan Statue Complex surrounding the monument has barely begun. 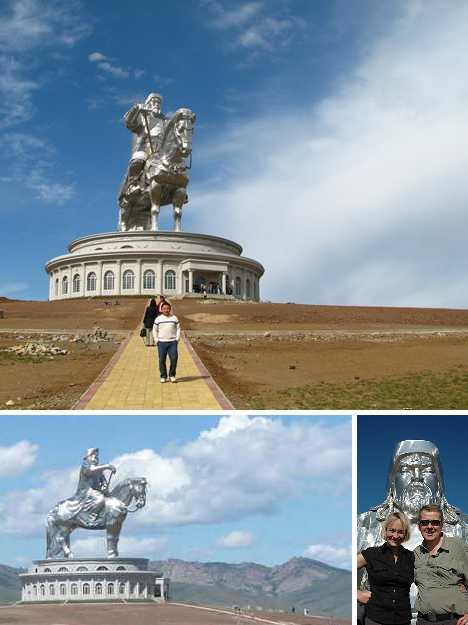 “Mongolians are happy when they see this statue,” stated Damdindorj Delgerma, chief executive of the Genco Tour Bureau, “and now people from all over the world will come to learn about the importance of Mongolia in history.” Giddyup! Do we detect a hint of one-upmanship in what seems to be a race to construct ever-taller statues? 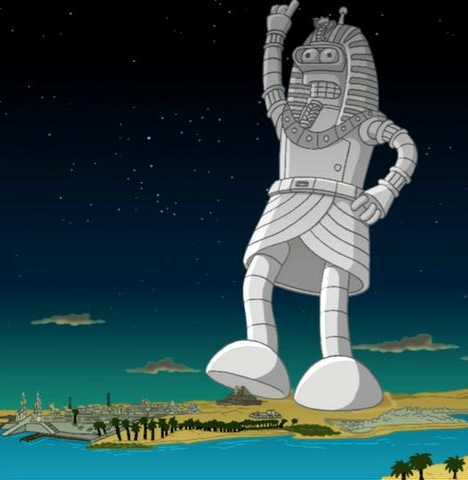 Will we one day see a statue so tall, workers will have to don space suits and jet packs just to finish it? It could happen, and not just on an episode of Futurama. “Remember me…” We will, Bend… umm, what was his name again?